Classic game Achtung die Kurve is available on Windows Phone Store for Windows Phone 8 game players with its new name Achtung!. 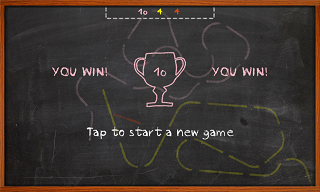 Windows Phone Store is now hosting this addictive and fun game Achtung among Windows Phone 8 games collection. The game is a modern version of Snake, classic legend Windows game. Now Achtung supporting multiple players, you try to draw curves avoding a collision with your rivals curve paths. Each collision gives points to other still alive players. So as long as you can control your point steering curves on the game board, you have the chance of earning points for the collision of other players. Achtung game is simple but fun. Your kids will love this game. I'm sure you will also enjoy playing this addicting game. Visit the official Windows Store page of Achtung for more information for download and game screenshots.